Hot Cocoa: A chocolate lover’s favorite, our Hot Cocoa Bar features gourmet milk chocolate combined with steamed milk to create a velvety, rich taste. 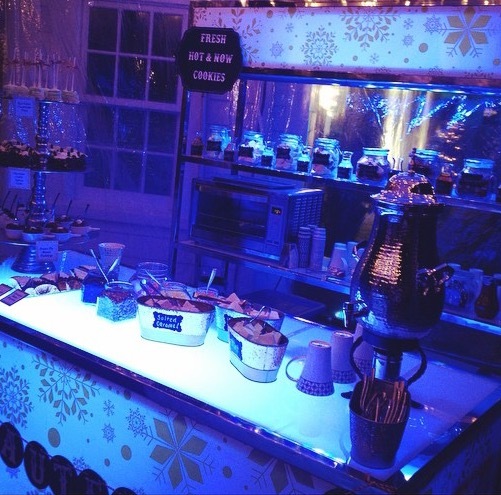 Wow your guests with our assortment of hot cocoa accompaniments such as peppermint chips, shaved chocolate bark, chocolate drizzle, caramel drizzle, pirouette crème filled pastry rolls, Aztec spiced sugar, whipped cream, homemade flavored marshmallows and toffee pieces. Sweet dreams are made of steaming mugs of our rich, creamy gourmet hot cocoa. Haute Pastries: The perfect pairing with our gourmet Hot Cocoa and Espresso bars. Fresh gourmet pastries served ooey gooey warm. Choose from sweet bread slices, mini donuts, mini cinnamon rolls, mini brownies, and mini cookies. Hott Espresso: Our deliciously crafted beverages made by our professionally trained baristas make our espresso bar ideal for any event. Freshly roasted fair-trade, organic gourmet beans and our stunning stations will make a remarkable impression on your guests while indulging everyone with perfect espressos, amazing lattes, stylish cappuccinos and delightful teas. Includes gourmet biscotti and tea cookies.